Well, that was a close call. After all my confidence the other day, I went and had a family emergency. Let's just say the last few thousand words are very poor, and leave it at that. Well, that was fun. And a lot harder than I expected. Which is even more annoying, considering that I expected it to be quite difficult! This next month will mostly be editing, though I hope to finish at least two new stories as well. I think it's important to keep writing even when you're doing other things related to said writing. Spending an entire month doing nothing but editing does get a lot of editing done, but it gets pretty much no writing done. Since writing's the hardest part, well then, it's fairly obvious what needs to be practiced most. * It's important to keep your goals humble and realistic. There's a reason I didn't capitalize that "g."
I'm definitely going to make it, which is nice. Granted, I've only attempted once before, but still. It's nice to know I can accomplish something like this if I really press myself on it. A man who lived his entire life on a small space station scrambles to fix it, as more and more things go wrong. As the story progresses, the reader finds out why he's the only one there. A man has experience in dealing with minor magics here and there, and one day sees a fairy in the woods. He becomes obsessed with finding her again, finding out who he is, to the detriment of his family and village. A knight on a great quest is gravely wounded, but healed by a beautiful forest spirit. As time goes on, he becomes so obsessed with the spirit that he abandons his great quest. An elf girl, trained to bring in the spring with a ritual dance, is barred from it as she has committed anathema. She struggles to complete the ritual anyway, for the sake of her tribe. I do recognize that two of those stories are quite similar. It's almost as if I finished one story, then realized it worked a lot better if I changed all the characters and the setting. Imagine that. Right now I'm working on this one: A scientist who runs mice through mazes begins to lose his mind, thinking that he's in a maze, himself. Overall, I'm satisfied with how the month has gone. I could have done more, but there's no reason to focus on that kind of thing. I am proud of several of these stories, and after a good bit of rewriting, hope to start submitting them soon. I was watching Maverick tonight and had a realization. 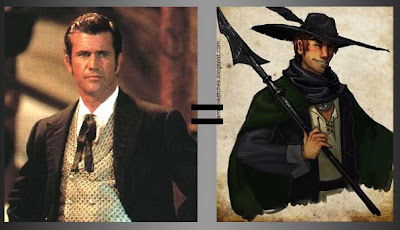 Specifically, that realization that I went ahead and titled this post with: there is no significant difference between Bret Maverick and Matrim Cauthon. They're both gamblers. They're both exceptionally good fighters. Considering that they spend quite a bit of time fighting for their lives, they certainly like fine clothing. Maverick imports his silk shirts in all the way from Paris, for crying out loud! And most importantly, they're both the luckiest people alive. Maverick doesn't even need to look at his cards to know he's going to win. I just thought I'd throw that out there. And yes, I know that there's a TV show. But I've never seen any of that, so I'm going by the movie. Do all stories need a villain? Sure, almost any story needs an antagonist, but that antagonist doesn't need to be a person. Since we are talking about speculative fiction, I should add that by "person" I do not necessarily mean "human." A villain can be an alien, a robot, a fairy, a sentient stone, a god, God, or an evil book. However, to be a villain, the antagonist does need to have at least the potential for personality. Whether the villain has personality or not depends on how well you write him. In my last post on villains, I talked about this, why it's important that a villain be relatable. In this post, I'll talk about how a villain-driven conflict differs from others.